This 1,200 square foot, top-floor corner unit villa has new hardwood floors throughout the villa, new windows, mattresses, closet doors and a new kitchen stove. There is a sleeper sofa, TV's and ceiling fans in all bedrooms. It is located on the 4th floor of bldg #1 near the outdoor pool, deli, convenience store, internet cafe and private boardwalk to the beach. The resort is a 24 hour gated community central to shopping, restaurants, bike paths, movie theaters and golf. It is located adjacent to Palmetto Dunes which houses the Robert Trent Jones Ocean Golf Course! There are two outdoor pools, one indoor heated pool (with kiddie pool, hot tub and sauna), indoor jogging track, six lighted tennis courts, racquetball, volleyball (at the beach), coin-operated laundry on each floor, elevators and free parking. The master bedroom has a pillow-top queen-sized bed and stand-up shower in the bath.2nd BR has a queen-size bed and 3rd BR has bunk beds (full and twin). The den has a pull-out sofa bed. The villa sleeps a maximum of 9 unless you bring a blow-up mattress. Wi-fi is available free for our guests. The TV in the den is equipped with a DVD. Dining table seats four. The kitchen is fully equipped with all amenities. All you need to bring is the food. Walk to the pristine, private beach via the private boardwalk over the beautiful salt-water marsh filled with wildlife, birds and exotic creatures. Just before the beach lies Coco's, our private cabana with food, drinks and restrooms. 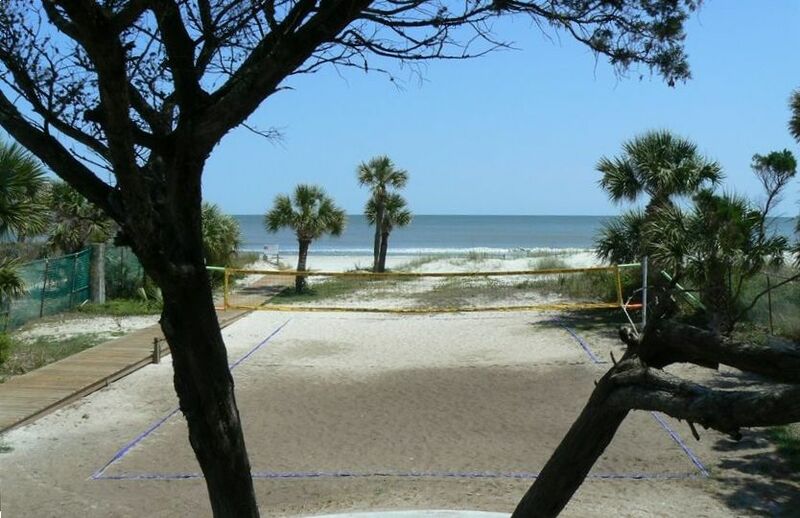 There is no better value for vacations on Hilton Head! toilet, combination tub/shower, 2nd bathroom. Shared washer across from elevators. Shared dryer across from elevators. Guests should bring their own beach towels. Next door at Palmetto Dunes. Lots of room, close to the pool and short walk to the beach!! Great place for a family vacation, young or old!! The condo was very roomy, clean and comfortable!! Julie and her family were awesome renters. Our air conditioner went out during their stay and they were very patient and understanding. They worked with our maintenance team while the new unit was installed and never complained once. I wish I could rent to Julie and her family year-round! Has potential but furniture is junk. Ideal for college kids who might destroy condo. Property is old but, property manager does a good job maintaining property. Beach is wonderful. Pictures showing open cafe were misleading. My disappointment was with the inside of the condo. Our furniture is not junk. We replaced both twin beds with twin/full bunk beds (during the guest's stay) and both queen mattress in the other bedrooms the following week. We have recently replaced the dishwasher, oven, recliners and any other items prior to them getting worn out. I'm not sure how a photo can be misleading but the cafe next to the pool is probably more festive/inviting during warmer months than in February when this guest stayed with us. The interior of the condo was just repainted (as it is twice each year) to keep it fresh. Our condo is a family-friendly environment and we've never claimed to be a Five Star Hotel. We strive to make sure our guests feel appreciated and we're thankful for each family that stays with us. Including this guest from February. Quiet top floor condo located close to shopping, restaurants, and beach. The owner is very quick to respond to any questions or concerns you may have. The beach theme wall décor adds a nice touch to the vacation atmosphere. The rental was not clean. Cobwebs in the corners and a layer of dust under the beds. There was hair on the bed sheets when we pulled the covers back in the master bedroom. There was dried food all over the kitchen counters. There was food stuck in the frame of the glass dining room table. The maintenance on the property was horrible. The television in the living room did not come on. I called the owner and he sent a "maintenance man" the following day. He played with the tv and got it to come on. He said that the television has been like that for a long time. Had to leave it on the entire time to have a television in the living room. The owner text me and said that someone would be back to replace it. We were there a week and never saw anyone. My son fixed the bathroom door knob with his Leatherman tool. The sink in the master bathroom could not be turned on, in the cold water side and was difficult to turn on, on the hot water side. The washing machine did not work. The dryer took 3 cycles to dry a load of clothes. The beds are horrible(all 4) and need to be replaced. I'm sorry and I'm don't like to complain, but when I pay for something I expect quality when I pay for quality. On the positive side, the owner Jeff was very nice and accommodating. The place is decorated very nicely. The kitchen is equipped very nicely for preparing your own meals. The only concern we received from this guest was that the TV did not work in the living room. We had our maintenance company respond immediately and he got the TV to work. I asked the guest if we needed to replace the TV and he said "no, I think it's fine. I'll let you know if it goes out again". He never called back. The TV will be replaced this week. We were not told of the additional items listed in this review. Our maintenance company is very responsive and would have taken care of the items immediately. The washer/dryer is in a locked closet and not available for guests. How they got access, I do not know. We take pride in maintaining an excellent place for our guests to spend their vacation and try to make repairs and corrections immediately. It's very difficult to do so we we are not made aware of items that need attention. Great place! Would love to visit again. The apartment was clean, neat and nicely decorated. We had lots of space to spread out and there was a TV in every room so there was no fighting over what to watch! Many of the furnishings were new. We had a great time and would definitely stay there again. Had a wonderful stay. It was quite and peaceful. I would recommend anyone to stay.